So the principles that govern the external appearance of the tenement are not about money or class, but fashion and function (it's a residence not a bank, gov't building, church or commercial office); the principles that govern the interior of a tenement are exclusively about money, class and purpose (reaping profit from others using it rather than using it or living in it oneself). Purpose is the underlying motivator of the ghetto and its most enduring gift to New York, the apartment building -- in legal technical terms, tenement (I'll have a post on the interesting and complicated permutations of the meaning of the word later on). If you build a house for yourself, you yourself will attempt to ensure that it will be pleasant, sanitary and sound. If you build for the free market, you will attempt to assure that what you build will appear to be pleasant, sanitary and sound to attract the highest possible rent -- the goal is not to live there but to profit. But if you build for a captive market, then you ensure only that it stands. 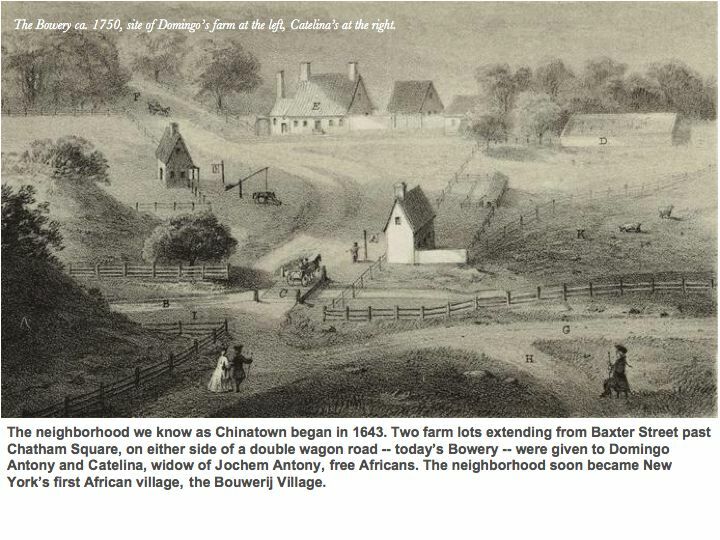 That's the history of the ghetto in New York in brief. Where there's more money to be made, there's more grasping for it. As demand increases, the grasping becomes more frenzied. New York City is that frenzy of exploitation. When land owners chose to give up on a piece of land as a place where he or his extended family or friends or his associates -- in other words, his class -- might live, he turned from the land to the structure built on it for rent. From that moment, the internal structure was determined by class, purpose and money-seeking. The external design remained slave to fashion and function. You can see this distinction today. When a landlord prepares to sell an apartment building, he will spiff up the entryway and the hallways. He will not fix your plumbing or your ceiling. The external and the internal are two different games. You can also see the significance of purpose today. Increasingly, apartments are owned by remote corporate giants which are ever more difficult to deal with. The law requiring a super living within 200 feet of the premise is gov't's attempt to mitigate the dangers of remote ownership. As more landlords skirt that law, more renters suffer loss of services more frequently and for longer periods of time. 1. 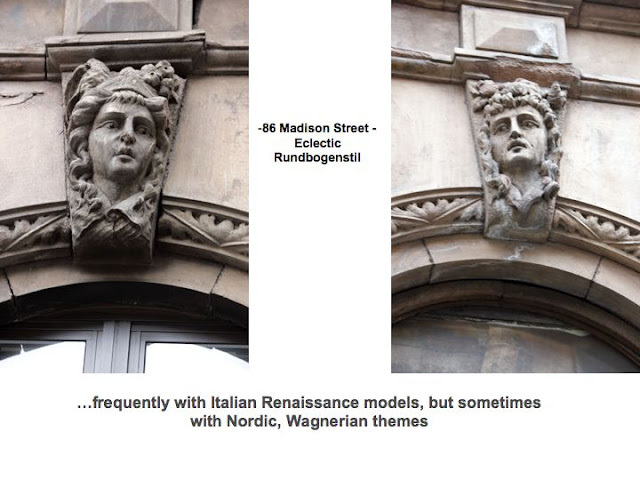 Rich vs poor was not a design distinction in architectural ornament. Even when the rich tried to distinguish themselves from a common style, the ghetto immediately imitated them. 2. The degree of lavish ornament among tenements does not correlate with rich or poor but with history. The streetscape is a jumble of unrelated historical period styles, not a swimsuit competition. 3. Function, however, was very much a design distinction in architecture. Banks and gov't buildings are the most obvious examples (except for churches, which in my haste I failed to mention; they are the most purely affective structures, intended either to inspire or comfort and often to signify sanctuary by being distinctly archaic or harmonious or grandiose or all of those). If banks propagate public confidence in stability borrowed from Roman lack of fashion changes, the gov't building to impress and intimidate, and the church to inspire or comfort, the residential building provides a stylish surround, consistent with the cultural norms of decor. 5. 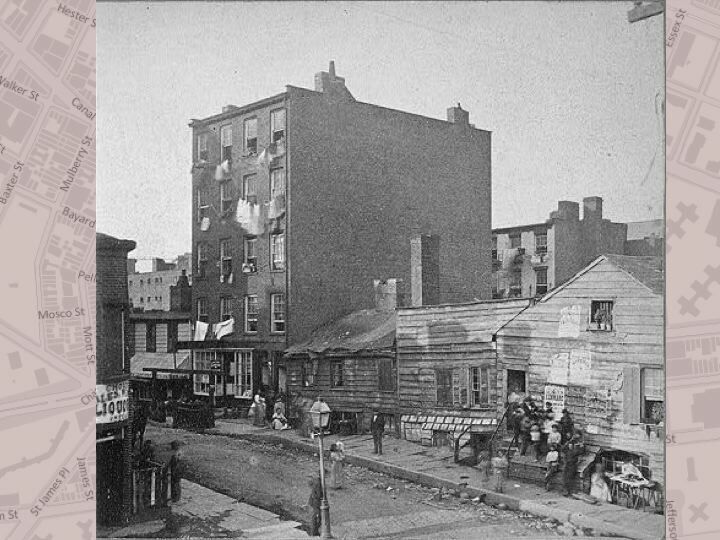 The back house is an indication that the landlord has given up on the value of the land, replacing it with the value of the structure on the land -- a shift from a personal dwelling in a desirable neighborhood to a commodity for others to rent in a ghetto for those who cannot rent elsewhere. That shift is pervasively explanatory. If I build for myself, I'm going to be sure that it's pleasant, sanitary and sound. If I build it just to make money from a captive consumer, the I care only that it's sound. 6. The captive market results in declining amenities as demand and rent increase, the opposite of a free market. At first, tenements were built with natural light and fresh air along the model of a townhouse, just taller. As demand increased, space, light, air and privacy were increasingly lost to rent-seeking -- packing the immigrants in as densely as possible. 7. 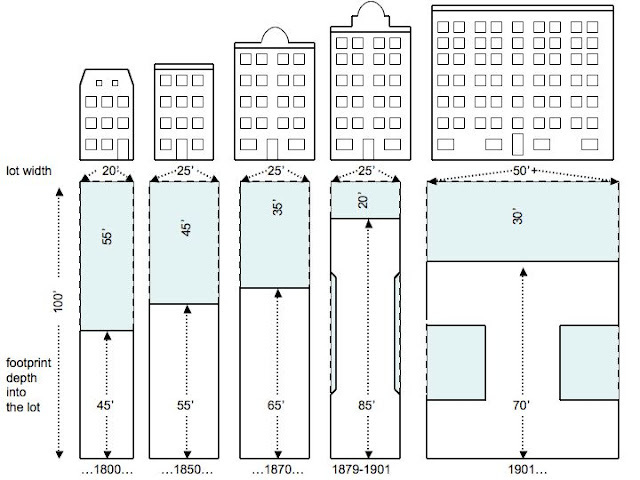 The height and depth-in-the-lot of the tenement correlates closely with the growth of the city's population, especially of labor growth. In short, the lesson of ghetto real estate is the shift from land value to structure value -- personal dwelling (amenities assured) to money-making for a captive consumer. The result is the inverse law of ghetto real estate: as exchange value increases (rent and demand), its use values declines (the amenities of space, privacy, light, air). It's the opposite of the free market where exchange values and use values rise together. Once the landlord doesn't want to live there, it's just a business. Ownership from afar is particularly harsh on housing. We see this today, where landlords are increasingly giant corporations remote from the needs of renters. Okay, we're about a third way through this series. 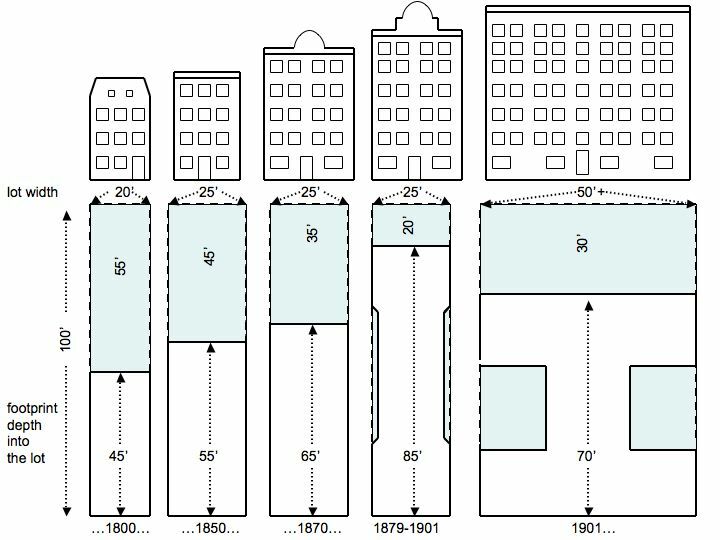 We've still got to look at why the first tenement built was also the tallest -- it seems to have held the longest record (40 years?) for tallest building in the city, although I don't believe it is recorded in the Museum of the Skyscraper; how laws changed the tenement structure; why corner buildings are usually built after 1901; when historians shouldn't be trusted; when writing on the wall should be disregarded; how to tell one period from another; why preservationists don't know the difference. That'll keep me busy for a couple of weeks at least. Next up: gov't intervention in this inversion of the market. It begins with Fernando Wood and the often misunderstood elitist origins of the Republican Party prior to the Civil War.